The authenticity of this work has kindly been confirmed by Bernhard Grünewald. Isaac Grünewald painted a series of flower paintings throughout his life and this subject matter lends itself particularly well to his expressive style and vivid use of colours. 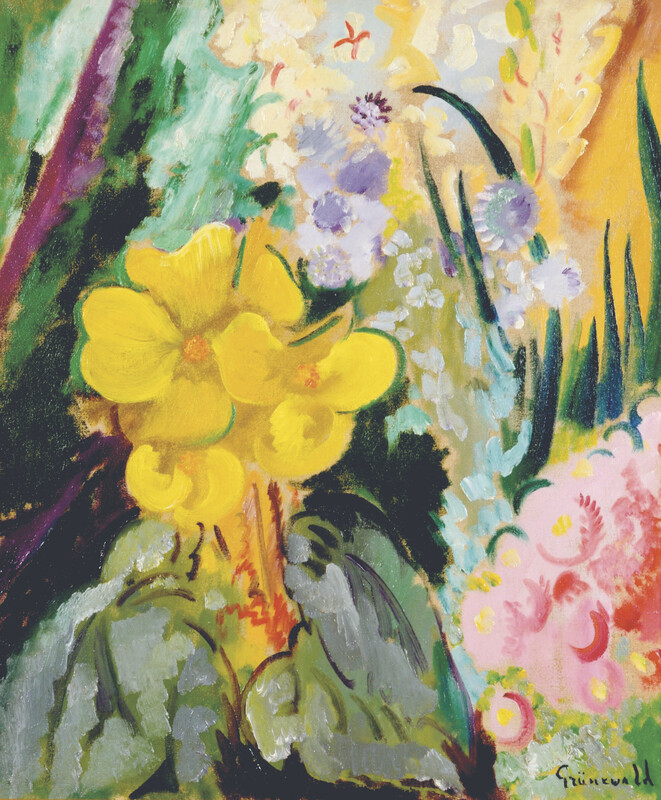 Beaming with optimism and thoughts about summer, the present painting does not depict the flowers arranged in a vase or bouquet, but strewn around the pictorial surface. Leaves and petals compete for attention and seem in delightful dialogue with one another. The close-up view is innovative and creates the sense that one can almost smell the flowers. It obliterates any idea of perspective - indeed the flatness of the painting creates an almost abstract, rhythmic composition, which is not unlike the effect achieved by Henri Matisse in many of his still lives. One of Sweden's leading modernists, Grünewald's pursuit here is the liberation of colour.